The traditional college student is between 18 and 22 years old. For this student, college follows immediately after high school and will last four years, a place to grow in maturity as much as knowledge. The amount of students who follow this timeline, however, has drastically diminished. Now, only 29 percent of the roughly 20 million college students qualify as “traditional.” The other 71 percent—also known as “non-traditional”—are elongating their four years by enrolling as a part-time student or are returning to school after time-off. Instead of four years, it now takes an average of six years to complete a college degree. » MORE: How to know if your college choice is affordable? But have colleges been paying close enough attention to this shift in student demographics? How do these non-traditional students maneuver college to make their most of their tuition dollars? NerdScholar asked university experts to offer advice on what to expect and how to make the most of college as a non-traditional student. A lapse in time between education years may also leave students feeling out of place among their classmates and illiterate in the latest technology, however they shouldn’t discredit their decision to take a leave of absence from school in the first place. “The gaps should never be frowned upon, for each learner differs in their approach to their own educational experience,” says Chad Lassiter, professor of Race Relations at the University of Pennsylvania. 2. Don’t discount real world experience. Time away from school can often give students invaluable perspective and a greater sense of purpose. Many non-traditional students return to school with more defined career goals and a wealth of practical experience, which even “has the potential to help the younger students with their overall growth and development,” Lassiter says. Non-traditional students are capable of discerning what is important and can better envision how their education will transfer over to real-world work. In general, says Shari Fox, executive vice president of O’More College of Design, “non-traditional students are more focused, prepared, and grateful to be pursuing their educational goals.” Returning to school is a very conscious decision for non-traditional students, arguably more so than other students. They are very aware of education’s costs and subsequent benefits. A budget is important for every student, but with a greater likelihood of increased expenses, non-traditional students should be especially meticulous about their finances. They also often carry much more responsibility, if not all of it, for tuition costs as compared to their younger counterparts. To start, students should list all sources of income, as well as their household expenses, to understand what type of education they can afford—a reduced course load, for example, can lower costs. Karen Hunt, director of admissions at Wittenberg University, advises students not to overlook any “hidden costs,” such as commuting or child-care costs when drafting up a budget. If students fall short, loans may be an option. However, Eric Chen warns students to proceed with caution when taking out loans. “My general rule of thumb is that you should only take on debt equal to 1.5x-2.0x your first year’s salary after graduation,” he says. 5. Take advantage of college support services. Eric Chen is currently an Associate Professor of Business Administration at the University of Saint Joseph in West Hartford, Connecticut. Eric holds a J.D. from the University of Connecticut School of Law, both M.B.A and Executive Management & Technology degrees from Rensselaer Polytechnic Institute, and an A.B. from Harvard University. Shari Fox is the Executive Vice President of O’More College of Design. She manages the day-to-day operations at O’More, which includes the academics, finance, administration, and admissions areas, and ensures that O’More upholds key academic standards. Data provided by the Education Department. 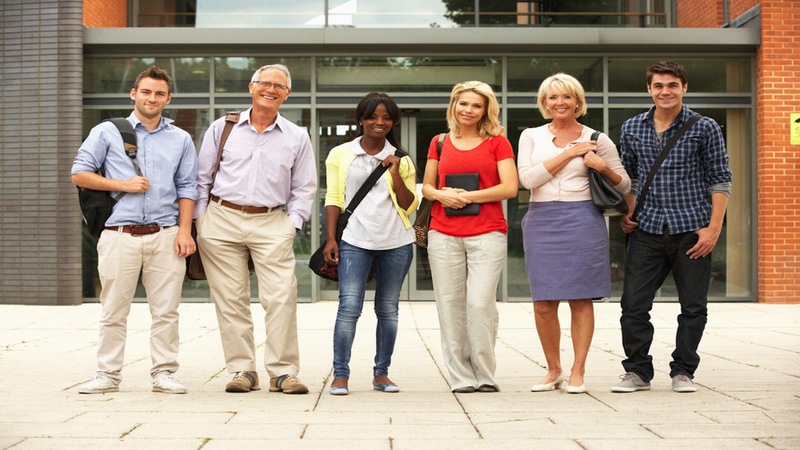 College students image courtesy of Shutterstock.